Dr. Stuart Sutherland is a Professor in the Department of Earth, Ocean and Atmospheric Sciences at The University of British Columbia (UBC). Raised in the United Kingdom, he earned an undergraduate degree in geology from the University of Plymouth and a Ph.D. in Geological Sciences from the University of Leicester for his studies on Silurian microfossils called chitinozoa. Professor Sutherland discovered his passion for teaching during an appointment at Brunel University in London. He went on to postdoctoral research at the Natural History Museum in London, working with other paleontologists to understand the Devonian organic-walled microfossils of the Cantabrian Mountains of northern Spain. During this time, he completed a postgraduate teaching degree at Sheffield Hallam University. Since 2000, Professor Sutherland has been on the faculty at UBC&rsquo;s Vancouver campus, where his interests center on Earth history and paleontology. He is a three-time winner of the UBC Earth and Ocean Sciences Teaching Award. 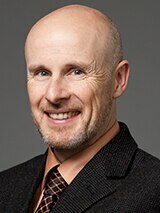 He also received the Faculty of Science Teaching Award and the Killam Teaching Prize, and he was named a &ldquo;popular professor&rdquo; in two editions of Maclean&rsquo;s Guide to Canadian Universities.